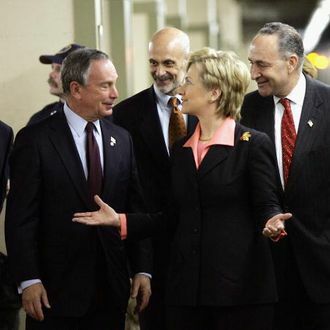 Michael Bloomberg has made no secret about his plans to endorse City Council Speaker Christine Quinn for mayor next year, but the news that he called Secretary of State Hillary Clinton to ask her to jump in the race suggests he’s still holding out for a better choice. Or at least he was. Clinton “left little room for doubt: she was not interested in seeking the mayoralty,” reports the New York Times, which broke the story of the call that happened months ago. We imagine Quinn’s next encounter with the mayor will be a little awkward after this. Bloomberg sees Clinton as a “globe-trotting problem solver like himself,” the Times reports, and the former New York senator certainly has a higher national profile than the City Council speaker. That fits with Bloomberg’s apparent goal of becoming a political kingmaker in his post-mayoral life, as does his opinion that mayor of New York is a bigger deal than president of United States. “If in fact he did say that to Hillary Clinton, it’s only because he holds the position and therefore regards it as a step up from being president,” Democratic National Committee member Robert Zimmerman told the Times. Clinton, of course, is regularly the subject of speculation for a 2016 presidential run, which she’s repeatedly denied, which only leads to more speculation. So let the Hillary 2013 rumors commence.